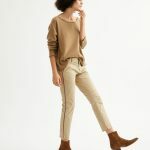 I am all in favor of the fashiony makeover that the lowly sweatshirt is getting lately, because when comfort and chic collide, happiness will surely ensue. 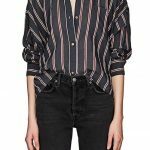 The deep V-neck and ruching at the bust line make this a feminine choice. I like that everything here is pretty straightforward, but then you’ve got that great bubble sleeve. 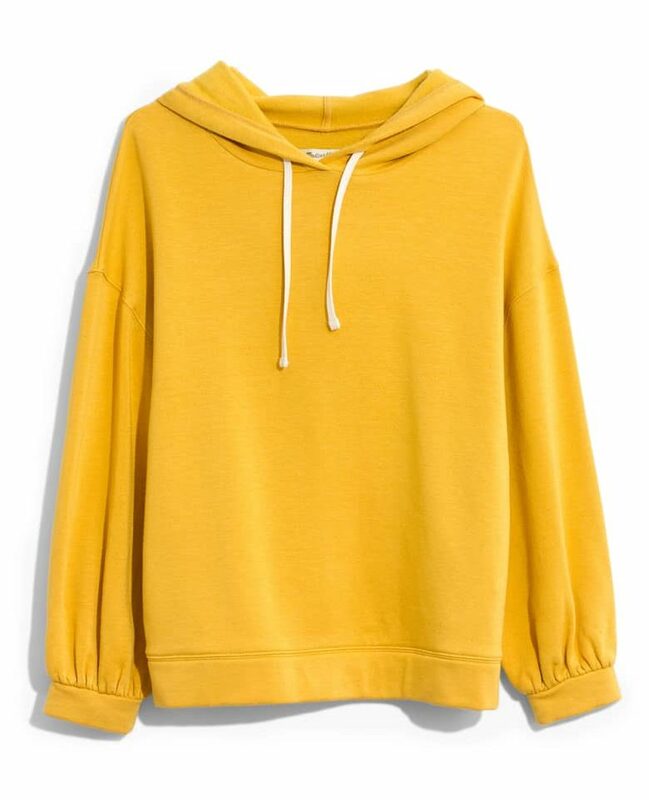 This hoodie also comes in black and grey, which might be more versatile, but I’m pretty partial to this excellent yellow. This leopard print is nice and graphic and really packs a punch. 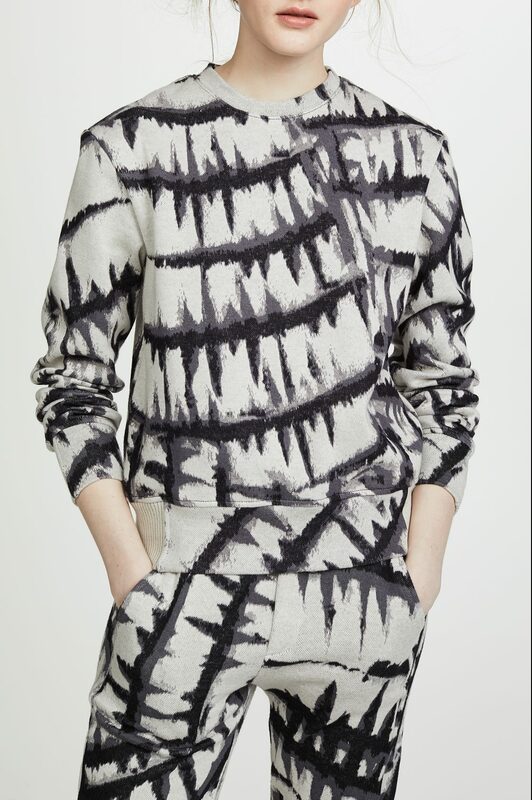 The tie dye print here has a kind of tribal feel that I dig. And this cropped, twist-front specimen looks like it’d be pretty flattering. Kim, I adore you, but it’s time to retire the term “tribal”. Like calling things “ethnic” or “exotic,” these terms make culturally-specific patterns completely generic and only indicate that they are “not white.” Tribal may be the most problematic of all because it also indicates that something is primitive and less refined. Of course sometimes use of these patterns altogether is also culturally appropriative, and I think it’s important for us to listen when people tell us to stop making their culture into fashion. But at base line, many people of color have been imploring the fashion industry not to use terms like tribal and ethnic. Because you’re such an influencer, I would love it if you could model it for others. Thanks for reading! Kim, I adore you, but it's time to retire the term "tribal". Like calling things "ethnic" or "exotic," these terms make culturally-specific patterns completely generic and only indicate that they are "not white." Tribal may be the most problematic of all because it also indicates that something is primitive and less refined. Of course sometimes use of these patterns altogether is also culturally appropriative, and I think it's important for us to listen when people tell us to stop making their culture into fashion. But at base line, many people of color have been imploring the fashion industry not to use terms like tribal and ethnic. Because you're such an influencer, I would love it if you could model it for others. Thanks for reading! Love the v-neck! Looks like an MM6, which I used to be able to afford (wah me!). ah! that’s what you call it- bubble sleeve. i love that. ah! that's what you call it- bubble sleeve. i love that. Thanks for the sweatshirts. So ready for Spring and tired of my Winter sweaters, so thinking these cute sweatshirts with maybe a tee or tank underneath are a good choice to ease me into Spring when it’s still freezing outside here in NYC. Oooooooooo, I love a good sweatshirt! The ruched v-neck is spectacular and while I’m not a huge animal print person, the leopard choice may make me change my outlook. Oooooooooo, I love a good sweatshirt! The ruched v-neck is spectacular and while I'm not a huge animal print person, the leopard choice may make me change my outlook. Concur on the ruched v-neck!! I have a few cute sweatshirts from Athleta.. that are too nice to actually wear while working out!